The U.S. Government is "the greatest purveyor of violence in the world today." - Martin Luther King, Jr.
A letter has been circulating in the T.I. community regarding my published ebooks. I am the sole author of my ebooks, and my name is clearly shown on the book cover. It is truly unfortunate when one individual, finds it necessary to misrepresent what I have published. I will continue to express my opinions, which are protected under the U.S. Constitution. Any real lawyer can confirm this - Opinions are protected speech. It is perfectly legal to publish my opinions on any subject. The Board of Directors at Targeted Justice has informed me, they fully support my efforts. In spite of certain claims, posting an address is not illegal - please visit Zabasearch.com or Veripages.com. You will find the home address for almost anyone in the U.S. If this was illegal, then it would not be public information and freely available for more than 10 years. Also, the FBI's use of the term "Non-Investigative Subject" is further evidence that the Watchlist is a sham. Why would the DOJ & FBI claim someone is a "known or suspected terrorist," place them on the Watchlist, and then not investigate them? Why would the FBI claim the Watchlist is "Classified Top Secret information" and then share the database with 700 private corporations - many without proper security clearances? Because the Watchlist is a sham and a coverup, to hide the Targeted Individual program. The Dept of Justice has already lied about this twice, to Federal Judge John Anderson. The Watchlist is a sham! Figure P-1. The CIA provides the funding under the Black Budget and directs the U.S. 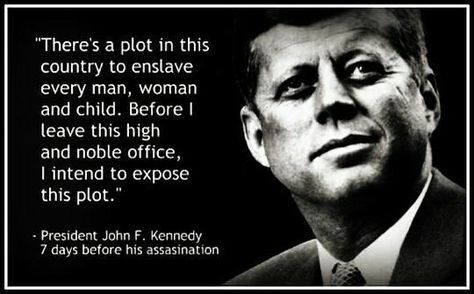 Shadow Government/Deep State agencies. The HSIC was created in 2005 to serve as the DHS' decision-making and implementation oversight board. These are the primary groups involved: CFR, CIA Operations, Air Force Space Command 50th Wing, DHS Intelligence & Analysis, Office of the DNI, Dept of Justice National Security Division, FBI National Security Branch, Defense Intelligence Agency. Figure D-1. Targeted Individual Diagram. Simplified process for what a Targeted Individual experiences. Try this - Firmly cup your hand over your ear, while in a very quiet room. You will hear the microwave "bullets" that are hitting your head from cell towers. Figure T-1. 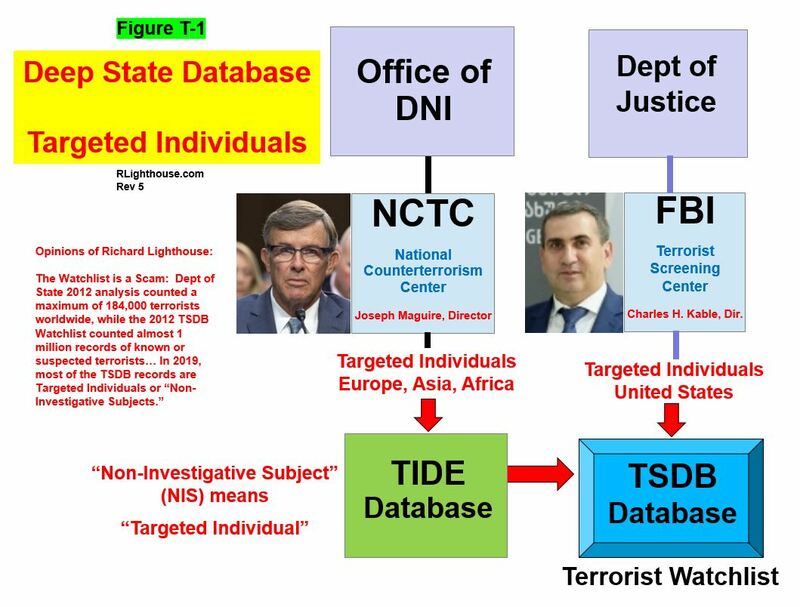 The National Counterterrorism Center (NCTC) is responsible for the foreign database, and the FBI's Terrorist Screening Center (TSC) inputs the domestic entrants. Most of the persons listed in the databases are "Non-Investigative Subjects," which is the government code for Targeted Individual. They are not being investigated because the FBI knows they are not real terrorists. The Watchlist is a Sham: Dept of State 2012 analysis, counted a maximum of 184,000 terrorists worldwide, while the 2012 TSDB Watchlist counted almost 1 million records of known or suspected terrorists… In 2019, most of the TSDB records are Targeted Individuals or "Non-Investigative Subjects." Further, the FBI's use of the term "Non-Investigative Subject" is evidence that the Watchlist is a sham. Why would the DOJ & FBI claim someone is a "known or suspected terrorist," and then not investigate them? Because the Watchlist is a sham to hide the Targeted Individual program. When a search is performed by police or sheriffs, TI's will show up as a "Silent Hit" - which means the only information that will be given to the police officer, is a confirmation that the person is on the Watchlist. No other details are provided to the officer. He is instructed not to detain you. Presentation submitted to a Senate Hearing, December 2014. This is an excellent introduction about Targeted Individuals. Handout - Most people are being Tracked using microwave pulses from cell towers. They are directed at your head, not your cell phone. Sworn affidavit of Ted Gunderson, former FBI Chief. Mr Gunderson confirms the FBI's involvement with organized stalking and the Targeted Individual program. This affidavit is valid in any courtroom. This document is valid in any Federal or State courtroom, if you reference this affidavit as part of the case, Labella v. Federal Bureau of Investigation et al, Case No. 1:2011cv00023. "The CIA and FBI are behind most, if not all terrorism." - Ted Gunderson. "Targeted Individual" refers to Hate Crimes that are being orchestrated and conducted by the CIA, Air Force, FBI, DHS, and Mossad; globally affecting millions of people and their families. These Hate Crimes are a violation of fundamental human rights, International Treaties & the U.S. Constitution. For Air Force & CIA officers - it is an act of High TREASON and a War Crime under Article 32 of the Geneva Conventions. The FBI runs the gangstalking program, which is designed to harass, intimidate, and break down the target. The FBI outsources much of the local harassment to community groups, such as Infragard, Citizen Corp, Neighborhood Watch, and similar programs. Targeted Individuals are placed on the Terrorist Watchlist and tracked as "Non-Investigative Subjects," so that local police and sheriffs can be instructed not to assist with their emergency calls. The CIA and Air Force operate the Microwave Weapons program through the underground complex at Schriever Air Force Base, near Colorado Springs. The microwave weapons used are the Vircator, which is mounted on a satellite, and high-power magnetrons which are mounted in cell phone towers. MQ9 drones with magnetrons are also increasingly being used. The microwave beams generally target the head and cause long-term brain damage via white matter deterioration. In Houston, Texas, some of the MQ9 Reaper drones are parked in hangars at Ellington Air Force Base, and these are used against civilians as part of the Targeted Individual program. Shooters, Aaron Alexis and Myron May are two recent examples of Targeted Individuals. They were psychologically destroyed using sleep deprivation, intense microwave attacks, and isolation from their family, and then they resorted to killing. Voice-To-Skull (V2K) signals can be embedded in the microwave frequency which allows the government criminals to send constant, hate-filled messages at the target. There are numerous U.S. Patents on these technologies. It is likely that most, if not all, school shooting events are orchestrated by the CIA and FBI using the subliminal messaging techniques developed under the CIA's MK-Ultra program. "The CIA and FBI are behind most, if not all terrorism." - Ted Gunderson, former FBI Chief. Many respected Medical Doctors and Government Scientists have confirmed that the Targeted Individual Program is real, including former CIA and FBI agents. Sworn affidavits from FBI agents, Ted Gunderson and Geral Sosbee, are part of this evidence. These Unconstitutional acts are considered Crimes Against Humanity ("systematic attack against a civilian population") and a War Crime (Article 32 of the Geneva Convention). It is estimated that there are about 170,000 Targeted Individuals in the U.S., and that it costs more than $1MM per person per year, to operate the program. The Council on Foreign Relations (CFR) provides the orders to the CIA and FBI, and this experimental program is administered worldwide. Free ebooks available in the STORE. 1. 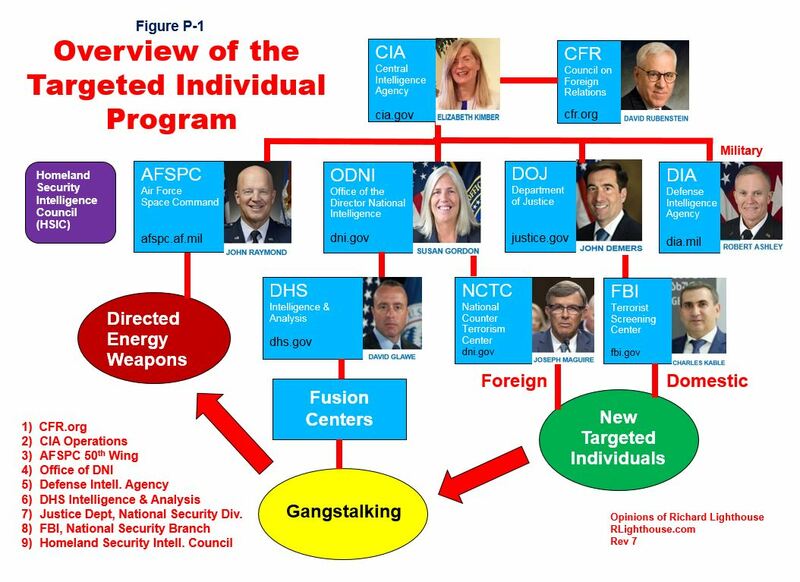 Targeted Justice has obtained the sworn affidavit of two FBI Agents, Ted Gunderson and Geral Sosbee, clearly stating that the gangstalking and Directed Energy Weapons are real and being used against U.S. citizens. TI's should print this out and save it. It is valid in any court room. 2. Basic information for building a Faraday Cage has been provided on this website. See the Military Handbook - "Faraday Enclosure Design." 3. The Titan Corporation in San Leandro is the company that made the satellite microwave weapons. The company has since been acquired by L-3 Technologies. The Electromagnetic Gun is called the "Thunderbolt System," and it is based on the U.S. Patent granted to Donald J. Sullivan in 1982. 4. We have learned that Raytheon Ktech in Albuquerque, New Mexico, is building the next generation of high-power microwave system that will likely be used against civilians. It is called the CHAMP system. 5. 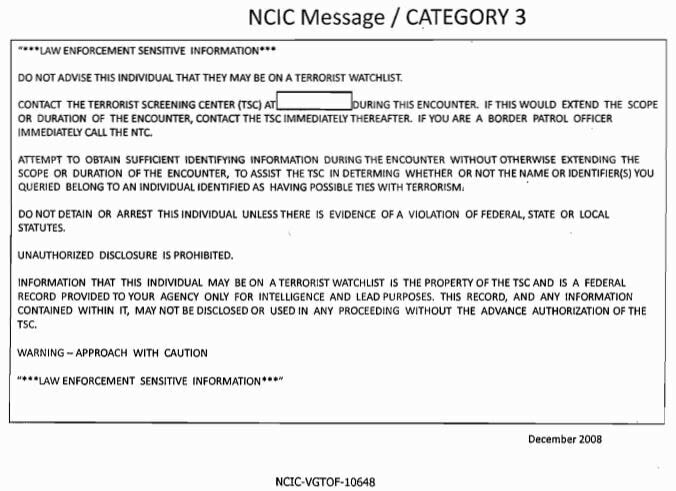 TI's are tracked using the Terrorist Watchlist system. If you are stopped by police for any reason, consider telling the Officer that your name might appear on the Watchlist as a "Non-Investigative Subject, Silent Hit." (Source: ACLU.org) This causes many problems for the crooked FBI. 6. The Air Force Space Command in Colorado Springs, Colorado operates the satellites that are targeting individuals all over the world. The Air Force personnel that "push the button" to hit you with microwaves, sit at a computer desk located underground, at Schriever Air Force Base. The CIA provides the funding for the program. If your family members are being hit with subliminal messages and turned against you - this is the organization that has their GPS coordinates and keeps track of them. General John W. Raymond is the Commander. A enhanced Faraday Cage that is properly designed and properly grounded, can block microwaves and the V2K. It can also block synthetic telepathy, Artificial Intelligence signals, and whatever other descriptions you have heard. The people that designed this technology for Schriever Air Force Base are not medical doctors. They are engineers. Your microwave oven is a good example of a Faraday Cage. The microwaves in this case, are kept inside the cage, rather than outside. In simple terms, a Faraday cage is a metal box or shell that protects whatever is inside from electrical currents. There has been a huge disinformation campaign by the CIA to convince TI's that an effective cage cannot be built. Don't believe it. A Faraday Cage is simple science and has been around since the 1800's. See the free Military Handbook - "Faraday Enclosure Design." Please read the free ebook available on this website: "How to Block the Microwaves & Jam the Tracking Signal." This ebook provides basic information for building your own Faraday Cage. To enhance the capability of the Faraday cage, try using an electric fence charger, typically 8000 volts and one joule rating. Note how the govt criminals respond to the charger pulse, to counter the signal. They synchronize with the signal (1.3 seconds/cycle) and crank up the power. This strongly suggests the microwave pulse can be blocked. (Although it needs more energy than one joule.) I will update this as I do more research... Please use EXTREME CAUTION when working with electrical systems. + Research done under contract with U.S. Air Force at Mission Research Corporation, in Albuquerque, New Mexico – Donald J. Sullivan (approx. 1977 – 1980). + US Patent 4345220, Submitted Feb. 12, 1980 for the Vircator Microwave Weapon. + Groundbreaking for what will become Schriever Air Force Base - May 1983. + Titan Corporation in San Leandro, California builds prototype Vircator, in 1983 - 1984. Modified to become the Reltron, which has higher efficiency. The completed hardware is named the Thunderbolt System. + Mark Fleenor becomes General Manager, 1986. + Strategic Defense Initiative launches about 24 to 30 satellites into geosynchronous orbit with the Thunderbolt System (Vircator/Reltron): 1987 – 1992. + The 2nd Space Wing at Schriever Air Force Base takes operational control of the Air Force Satellite Control Network beginning in October 1987. The Air Force Satellite Control Network was previously located in Sunnyvale, California - the home of Lockheed Missiles and Space Company (LMSC). + Targeted Individual, Harlan Girard, reports first microwave attacks from satellite, 1987. + 50th Space Wing is activated at Schriever Air Force Base, 30 January 1992, replacing the 2nd Space Wing. + In July 1992, the US Government claims the Strategic Defense Initiative (SDI) program was canceled. What this really means – it is now fully operational. The current Vircator Microwave Weapons have been measured at 3920 - 3935 MHz. The FCC frequency allocation table confirms this is a satellite-to-ground frequency. "The Titan Corporation has been developing directed energy technologies since the early 1980s. Over this time Titan has provided advanced power supplies for electromagnetic gun and laser research while making broader contributions in the field of high-power microwaves (HPM). Titan's HPM work expanded from initial efforts fielding and operating the fist gigawatt-level oscillators for susceptibility test applications, to research and development maximizing the peak and average output powers and overall efficiency realized from such systems. As interest in HPM technology has spread globally, Titan has leveraged this core competency and provided the HPM equipment for nearly all of the major European effects test facilities. Titan's current interests focus on compact, efficient and reliable directed energy weapon systems and the advanced subsystems and components that enable the same." 753122 10/12/17 Abolish the Federal Reserve - describes the corrupt Federal Reserve system and how they are connected to TI's. 755355 10/25/17 Manipulation of Secondary Personalities - describes the technology used to manipulate your family members. 757833 11/07/17 Cell Towers and Targeted Individuals - Cell towers are the main weapons used to hurt TI's, this is how it works. 761510 11/26/17 Psychiatric Fraud - provides information from many doctors that psychiatry is basically a fraudulent lie. 914461 12/25/18 The Governors of Gangstalking - identifies the top two government executives that lead the gangstalking. 919669 01/24/19 Targeted Individuals: Standard Nomination Form - shows the form that was used to put you into the T.I. program. 921510 02/03/19 Ten Most Wanted Deep State Criminals - lists the top 10 government criminals that work on the T.I. program. 926624 03/03/19 Medical Fraud & the Deep State - provides examples of medical fraud, attempting to cover up the microwave attacks.